The disappearance of a young boy leads the residents of a small town to uncover a sinister conspiracy. There's little in the way of originality on offer here, and the various plot beats often feel as though the writers locked themselves away with every issue of Starlog magazine from 1978 to 1982 as chief inspiration. Yet while highly derivative, Stranger Things has a charm all of its own; there isn't an ounce of cynicism to be found in what is very much a heartfelt love letter to genre cinema and TV. Stranger Things is now available to stream on Netflix. American cinema is currently obsessed with nostalgia, specifically for the 1980s. For Hollywood it's a cynical reaction to dwindling box office numbers - take a franchise people loved when they were kids and hopefully they'll bring their own kids along this time out. But there's also a more honest nostalgia at play in the work of several current filmmakers - Adam Wingard's The Guest, David Robert Mitchell's It Follows and Jeff Nichols' Midnight Special all recall the genre fare of the '80s without explicitly cashing in on brand names. The latest Netflix original series, the 1983 set Stranger Things, falls into this latter camp, as showrunners The Duffer Brothers mine the childhoods of those who grew up in that none more fetishised decade. Immediately, we're brought back to the era of Amblin, as the show introduces us to a quartet of young boys engaged in a heated game of Dungeons & Dragons. They're an awkward but instantly likeable bunch, somewhere between the protagonists of The Monster Squad and the 'geeks' from Freaks & Geeks. While cycling home (on a BMX, of course) one of the boys, Will (Noah Schnapp), is menaced by an unseen force before mysteriously disappearing. The following morning a young girl, who later comes to be known by the name Eleven (Millie Bobby Brown), wanders into town. We quickly learn she possesses Carrie-esque telekinetic powers, and the Duffers initially convey this in a very simple, Spielberg-esque sequence in which she steadies a rotating fan that's interrupting her enjoyment of fries at the diner she wandered into. On the tail of Eleven are members of a shady government agency, led by Martin Brenner, played by Matthew Modine, bearing a resemblance to one of the robotic suited killers of Halloween III. Through flashbacks over the course of the eight episode season we learn of Brenner and Eleven's role in secret experiments initially designed to exploit the girl's powers as a device for spying on the Soviets, but which have unwittingly unleashed supernatural forces as a result. 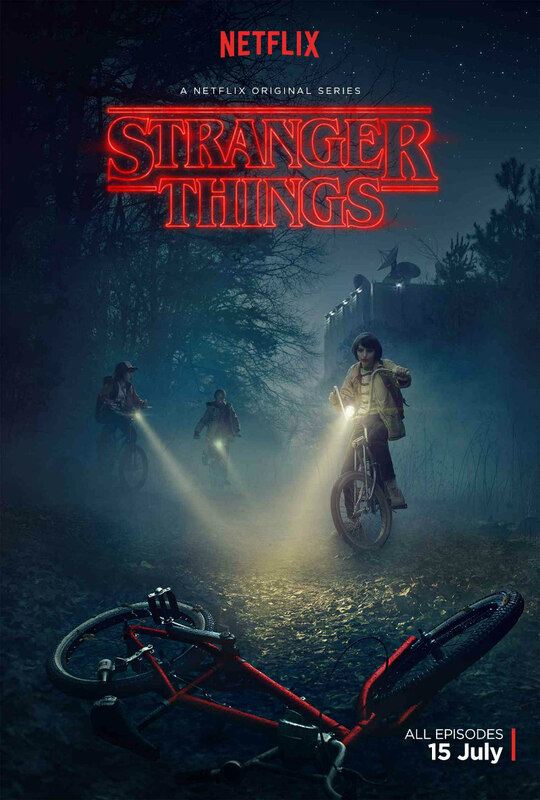 Eleven hooks up with Mike (Finn Wolfhard), the best friend of the missing Will, and along with his buddies Dustin (a highly endearing Gaten Matarazzo) and Lucas (Caleb McLaughlin), they set out to find their friend. 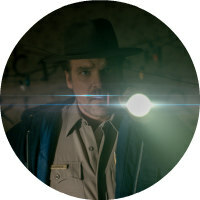 Also investigating is Will's mother Joyce (Winona Ryder), who believes she is being contacted by her son through the manipulation of light-bulbs in her home, and in a more official capacity, local Sheriff Jim Hopper (David Harbour), who slowly comes to believe Joyce's claims of a supernatural element to her son's disappearance. Rounding out the subplots is that of Mike's older sister Nancy (Natalia Dyer), who we initially assume will be no more than the classic disbelieving sibling stereotype, but ends the season as a riff on Heather Langenkamp's Nightmare on Elm Street heroine, also called Nancy, un-coincidentally. She's dating local jock Steve (Joe Keery, an actor who boasts one of those faces you instantly want to punch), but begins to bond with Jonathan (Leonardo DiCaprio lookalike Charlie Heaton), the socially awkward older brother of Will. 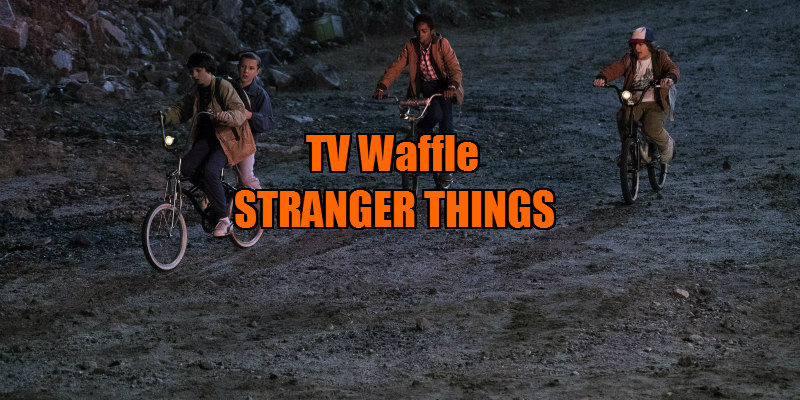 While the initial setup and character dynamic of Stranger Things owes much to '80s era Spielberg and Stephen King, the Duffers pull from a host of sources and eras. Harbour's sheriff and his comic deputies are right out of one of writer Lane Slate's '70s TV movies, in which affable small town police unwittingly find themselves part of a larger conspiracy. There are visual references to John Carpenter's remake of The Thing, but a climactic set-piece also borrows heavily from the ending of the original 1951 movie. And that very '90s cultural phenomenon The X-Files is a strong influence; think of a storyline from that show if Mulder and Scully were the villains and you'll have an idea of how Stranger Things plays out. For the most part, the show's nostalgia refrains from indulging in audience winking, and if the period setting initially seems like a mere gimmick, the plot gradually reveals why the story could only be set in the pre-internet cold war era. That said, there's little in the way of originality on offer here, and the various plot beats often feel as though the writers locked themselves away with every issue of Starlog magazine from 1978 to 1982 as chief inspiration. Yet somehow it works, and while highly derivative, Stranger Things has a charm all of its own; there isn't an ounce of cynicism to be found in what is very much a heartfelt love letter to genre cinema and TV. Neither the Duffers or Shawn Levy, who directs two episodes, pull up any cinematic trees in their helming of the series, but the production design and the cinematography of Tim Ives and Tod Campbell (both moonlighting from cult show Mr Robot) make this a visually arresting experience. The sequences in 'The Upside Down', an alternate dimension that exists alongside the central location of the small town, are quite spectacular to behold, owing much to the aesthetic of Ridley Scott's Alien and Lucio Fulci's The Beyond. More so than any of Netflix's other original series, Stranger Things plays like one long story rather than a series of specific episodes. In no way individually thematic, the eight episodes don't really stand alone, and if you binge watch the show, its credits appear placed in what seems like arbitrary fashion; episodes will often have more dramatic cliffhangers at their midpoint than at their climax. Something Netflix may wish to introduce is the option to view their original series in one uninterrupted sequence, sans credits. This debut season wraps up its storyline, but leaves itself open to a followup, which now seems certain to be greenlit. Hopefully the Duffers can build on the goodwill they've earned and produce something of a more original flavour second time around.